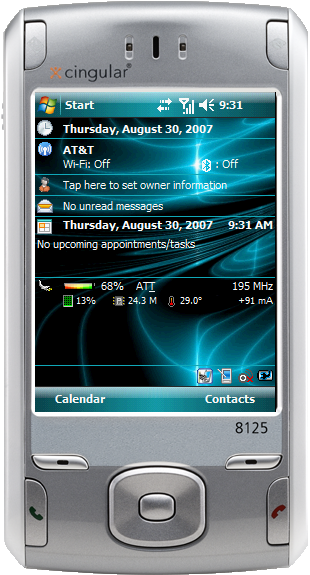 Getting WM6 on my Cingular 8125 proved to be a much more vexing challenge than I anticipated, especially considering the development for it over at xda-developers.com. The main issue was getting the 8125 CID Unlocked, which allows non-home carrier ROMs to be installed. Running a multitude of tools to unlock the device resulted in failure but I couldn’t figure out why because it was supposed to work, especially on the Wizard. Then I found this post on xda-developers.com which indicates that Wizards that have been upgraded to Windows Mobile 5 with AKU2 (notable for the DirectPush functionality) have the portion of the DOC (Disk on Chip) that stores the carrier ID set to read-only. Faria’s instructions show how to successfully CID Unlock the device by first downgrading the ROM to a non-AKU2 version. Of course, it can’t be any ROM since the CID is still locked, so it has to be one from Cingular or something cooked. I could not find anywhere the Cingular 1.8 ROM that is recommend to use. I trolled Google, AT&T forums, xda-developers, Google Groups, but the binaries had been pulled awhile ago. The other option was a cooked ROM that doesn’t check for a carrier ID. Again, I could not find the one mentioned, until I found a forum post that linked to another post on a French forum where the ROM is available. That took awhile to download. Downloaded and installed the custom 1.05 ROM, called CUSTOM__RUU_Wizard_1050412_WWE_101_11210_WWE.exe. Downloaded and ran lokiwiz’s CID Unlocker .2b. Downloaded and installed the T-Mobile 2.26 ROM. Downloaded and installed IPL/SPL 3.08. Downloaded and installed radio 2.19. Downloaded and installed Faria’s WM6 ROM.